It occurred to me last week that I may not live in Rome, Greece, Egypt, or some other place full of ancient architectural examples that I can only one day hope to see in person, I do live in an area of fairly significant architectural examples that others across the globe may not otherwise get to see. The Dallas/Fort Worth Metroplex and Mid-Cities area has many interesting architectural achievements (like the Kimbell Art Museum) that, while not ancient history, are relevant and show important progressions in architecture from the last couple of centuries. This begins a series of architectural photos I'll be doing on Historic Dallas buildings, monuments, museums, etc. 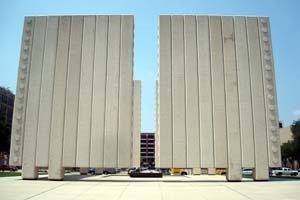 Our journey begins with the Historic District in Dallas, at the John F. Kennedy Memorial Plaza. If you click on the photo, a larger version will appear, but be advised it takes a while to load. I have transcribed the text of photos, for convenience. President John Fitzgerald Kennedy (1917-1963) was assassinated in Dallas, Texas, on November 22, 1963. This event changed the city--and the world--forever. As a tribute to this extraordinary man, John F. Kennedy Memorial Plaza was dedicated on June 24, 1970. In the years since, it has become an integral part of the City's urban landscape and cultural heritage. 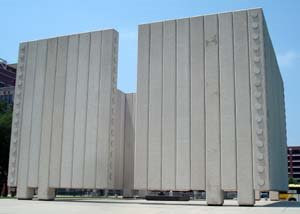 The Monument, Johnson's design is a "cenotaph," or open tomb, that symbolizes the freedom of Kennedy's spirit. The memorial is a square, roofless room, 30 feet high and 50 by 50 feet wide with two narrow openings facing north and south. The walls consist of 72 white pre-cast concrete columns, most of which seem to float with no visible support two feet above the earth. Eight columns extend to the ground, acting as legs that seem to hold up the monument. Each column ends in a light fixture. At night, the lights create the illusion that the structure is supported by the light itself. The corners and "doors" of this roofless room are decorated with rows of concrete circles, or medallions, each identical and perfectly aligned. 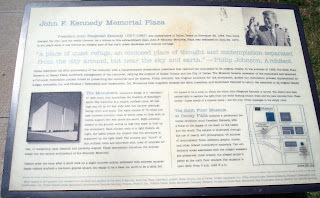 These decorations introduce the circular shape into the square architecture of the Kennedy Memorial. Visitors enter the room after a short walk up a slight concrete incline, embossed with concrete squares. Inside visitors confront a low-hewn granite square, too empty to be a base, too short to be a table, but too square to be a tomb, in which the name John Fitzgerald Kennedy is carved. The letters have been painted gold to capture the light from the white floating column walls and the pale concrete floor. These words--three words of a famous name--are the only verbal messages in the empty room. 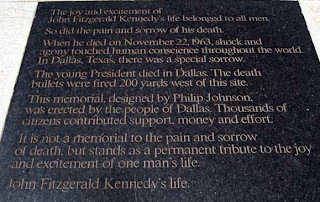 The Sixth Floor Museum at Dealey Plaza contains a permanent historical exhibition about President Kennedy, with a focus on the impact of his death on the nation and the world. The subject is illustrated through the use of nearly 400 photographs, 45 minutes of documentary films, artifacts, graphs, charts, and other related interpretive materials. Two evidentiary areas associated with the alleged assassin are preserved, most notably the alleged sniper's perch at the sixth floor window. The museum is open daily from 9 a.m. until 6 p.m.
From the south side of the monument you can see through the north side as well, which leads across the street into Founder's Plaza (which will be featured later this week). The monument itself is a lot more impressive upon reflection than while I was actually there. Keep in mind, it was in the heat of a 107 degree day, and this monument wasn't even my original purpose in coming to the district. I was actually there to photograph the old Dallas Courthouse (Old Big Red), which will featured this week in Part 2 of Historic Dallas. And in person, the monument looked exactly the same as each opposite side. There was little of interest inside. What you see is what you get. A large, split, concrete block. But when you consider how weak concrete is, horizontally, this is actually quite an impressive architectural feat. Those four little legs you see in front, and four exactly like it in back, are all that support this massive frame. And it is indeed massive. I wish I had come back at night to get some better photos, as I'd like to see the floating effect mentioned by the light illusion. Still, when you consider how perfectly measured the weight, load, position, and cut had to be for the structure to not crack in half under its own weight, or blow over in the incredibly powerful winds we get, and that concrete itself tends to dry out and crack over time, this is quite a remarkable structure in that it is still standing, is uncracked, and unsplit. It also manages to let in light and breeze, while simultaneously dampening the sound from outside the monument. It's almost eerie, stepping from the extremely busy streets of Dallas, and stepping into a bubble of quiet that exists for but a moment before leaving. The joy and excitement of John Fitzgerald Kennedy's life belonged to all men. So did the pain and sorrow of his death. When he died on November 22, 1963, shock and agony touched human conscience throughout the world. In Dallas, Texas, there was a special sorrow. The young President died in Dallas. The death bullets were fired 200 yards west of this site. This memorial, designed by Philip Johnson, was erected by the people of Dallas. Thousands of citizens contributed support, money, and effort. It is not a memorial to the pain and sorrow of death, but stands as a permanent tribute to the joy and excitement of one man's life. John Fitzgerald Kennedy's life. What Happened to Monday's Entry?